The Mediterranean diet consistently ranks as one of the healthiest diets to follow. Although it is primarily focused on plant-based eating, it does occasionally recommend eating meat. Oily fish is usually eaten at least once a week. Chicken features occasionally and even red meat isn’t totally off the menu. There is a great amount of overlap between Mediterranean and vegetarian diets. However, following a vegetarian diet doesn’t automatically mean you’re eating healthily. 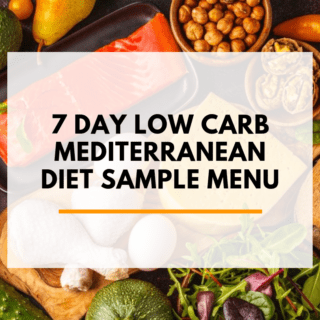 We’ll list out everything you need in this post to start the plan, but if you want to jump straight to the pdf which has all the recipes, shopping list and meal plan for the 7-day Mediterranean vegetarian plan, you can get the full plan as a pdf here. Just like the standard Mediterranean diet, if you’re eating a variety of foods in appropriate quantities, it’s unlikely you’ll miss out on key nutrients by following a vegetarian diet. The Recommended Dietary Allowance (RDA) is 0.8 grams of protein per kilogram of body weight per day or 0.36 grams per pound of body weight per day. For a 128 lb woman, this would be 46g of protein. Many plant sources have good amounts of protein. These include foods like beans, lentils, chickpeas, seeds, nuts, soy, and whole grains. Getting enough protein using these foods shouldn’t be too difficult. The other thing worth remembering is that plant-based proteins are usually incomplete proteins. This means they lack amino acids that are found in ‘complete’ proteins. Historically, vegetarians were told such foods do not need to be combined within a single meal. Today research shows that such foods do not need to be combined within a single meal. Dairy and eggs are also complete protein sources. The take home message? Simply make sure you’re eating a variety of foods throughout the day to reach your protein intake. Vitamin B12 is needed to help the production of red blood cells and maintain a healthy nervous system. It’s only found in animal products but that does include dairy and eggs. Some soy products and breakfast cereals foods may also be fortified with vitamin B12 If you’re not eating any animal-derived products, then you may need to take a B12 supplement. Iron in meat (haem iron) is more readily absorbed into the body than iron in plant foods (non-haem iron). You can increase the amount of iron that is absorbed from food by also having a source of vitamin C with your meal. Omega-3 fats are important for brain function and a healthy nervous system. In the meal plan are recipes for breakfast, lunch and dinner. Place the grated apple, oats, seeds, and cinnamon into a bowl. Stir in the yogurt and 100ml of cold water, cover and leave in the fridge overnight. Spoon muesli into bowls and top with sliced bananas and raisins. Chop the tomatoes, cut the cucumber into sticks, split the olives and remove the stones. Spread the houmous over the wrap. Put the vegetable mix in the middle and roll up. Cook the quinoa according to pack instructions. Meanwhile, heat 3 tbsp of the oil in a pan, then add the garlic and quickly fry for 1 minute. Throw in the carrots, leeks and broccoli, then stir-fry for 2 minutes until everything is glistening. Add the tomatoes, mix together the stock and tomato purée, then add to the pan. Cover and cook for 3 minutes. Drain the quinoa and toss in the remaining oil and lemon juice. Divide between warm plates and spoon the vegetables on top. For the dressing, Mix the oil, vinegar, chilli flakes and mint and then season. Put the tomatoes and watermelon into a bowl. Pour over the dressing, add the feta, then serve. Rinse and drain the beans and mix with the tomatoes, onion and vinegar. Season, then add basil just before serving. Heat the oil in a frying pan with a lid, then cook the onions, chilli, garlic and coriander stalks for 5 minutes until soft. Stir in the tomatoes, then simmer for 8-10 minutes. Using the back of a large spoon, make 4 dips in the sauce, then crack an egg into each one. Put a lid on the pan, then cook over a low heat for 6-8 mins, until the eggs are done to your liking. Scatter with the coriander leaves and serve with bread. Heat 1 tbsp oil in a pan and add the tomatoes. While they are cooking, beat the eggs in a jug and add the milk, black pepper, and basil. Remove the tomatoes from the pan and place on the plates. Add the oil, spinach and egg mixture to the pan, stirring occasionally until the eggs scramble. Once set, add to the plates and serve. Cook the couscous in vegetable stock according to pack instructions. Trim the ends off the courgettes, then cut into slices. Heat the oil in a pan. Add the courgette and season. Cook for 2 minutes, then turn over and cook until soft. Tip into a large bowl along with the cooked couscous. Add remaining ingredients, mix through and serve. Heat the grill. Arrange the vegetables over a grill pan &brush lightly with oil. Grill until lightly browned, turn them over, brush again with oil, then grill until tender. Meanwhile, put the beans in a pan with garlic and stock. Bring to the boil, then simmer, uncovered, for 10 minutes. Mash roughly with a potato masher. Divide the vegetables and mash between 2 plates, drizzle over oil and sprinkle with black pepper and coriander. Drain the jar of artichokes, reserving 1-2 tbsp of oil. Add the oil, sun-dried tomato paste and vinegar and stir until smooth. Season to taste. Chop the artichokes and tip into a bowl. Add the cannellini beans, tomatoes, olives, spring onions and half of the feta cheese. Stir in the artichoke oil mixture and tip into a serving bowl. Crumble over the remaining feta cheese, then serve. Heat the grill to high. Whisk the eggs in a bowl with the chopped parsley, pepper and salt. Heat the oil in a frying pan, then fry the onion over a high heat for about 4 minutes until they start to brown. Add the tomatoes and olives and cook for about 2 minutes. Turn the heat to medium & add the eggs, cooking them for about 2 minutes, stirring until they begin to set. Add feta, then place the pan under the grill for 5-6 minutes until the omelette is golden. Cut into wedges and serve. Cut the segments from 1 of the oranges and put in a bowl with the carrots, rocket and avocado. Whisk together the orange juice, zest and oil. Toss through the salad, and season. Heat oven to 220C/200C fan/ gas 7. Halve or quarter beetroots depending on size. Mix spices together. On a large baking tray, mix chickpeas and beetroot with the oil. Season with salt & sprinkle over the spices. Mix again. Roast for 30 minutes. While the vegetables are cooking, mix the lemon zest and juice with the yogurt. Swirl the harissa through and spread into a bowl. Top with the beetroot & chickpeas, and sprinkle with the chilli flakes & mint. Heat the oil in a saucepan, then fry the onion and celery for 10 minutes until softened. Add the cumin and fry for another minute. Turn up the heat, then add the stock, tomatoes, chickpeas and black pepper. Simmer for 8 minutes. Add broad beans and lemon juice and cook for a further 2 minutes. Top with lemon zest and coriander. 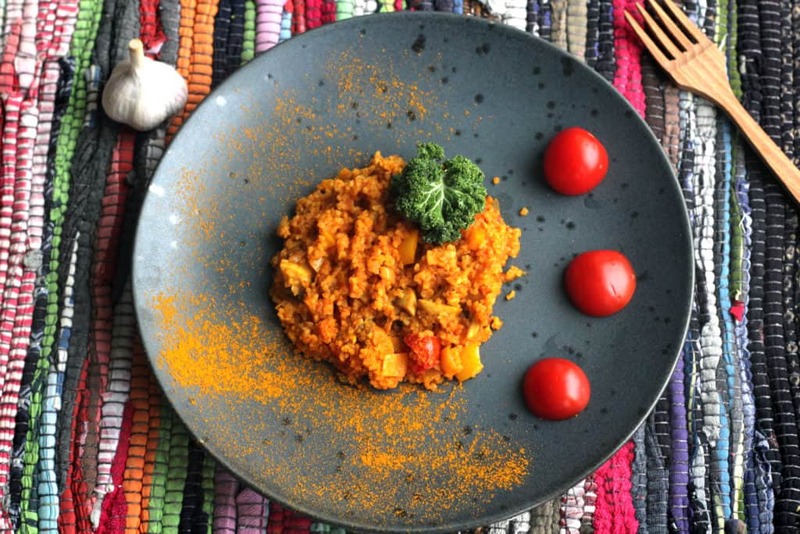 Cook the bulgur wheat according to pack instructions, then drain well. In a bowl, mix the garlic and olive oil and drizzle some of the olive oil over both sides of the aubergine strips. Sear the strips in a frying pan for 3 minutes each side until charred. Tip the bulgur wheat into a bowl with the chickpeas, tomatoes, onion, feta & mint, then pour over the remaining oil and lemon juice. Mix & season well, then serve with aubergines. Heat oven to 220C/200C fan/gas 7. Add oil to each aubergine side. Lay on baking sheets, season and bake for 15-20 minutes, turning once. Cook lentils following pack instructions. Heat oil in frying pan. Add onions and garlic and cook until soft. Add squash & tomatoes, plus ½ can of water. Simmer for 10-15 minutes until the sauce thickens. Stir in lentils, basil & seasoning. 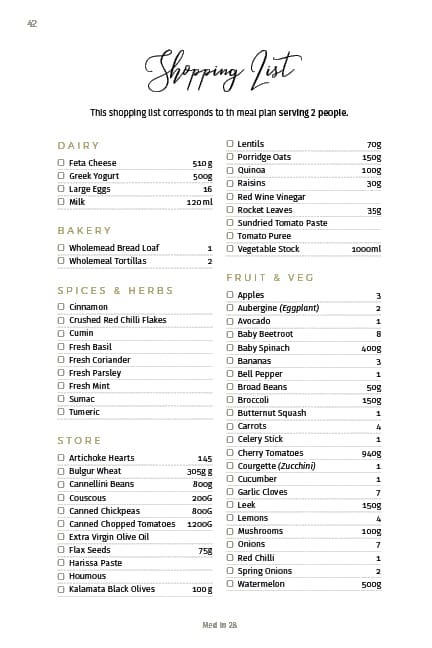 This shopping list corresponds to the 7 day vegetarian Mediterranean diet plan, serving 2 people. No snacks are included. Get the full pdf here.